What is a binary asteroid and how the BMO RESEARCH contribute to its understanding? Imagine if an approaching asteroid is hurtling towards the earth, the knowledge of the asteroid consist of 2 objects will mean either the survival of mankind or not. About 20% of asteroids that are known to be part of the NEA (Near Earth Asteroids) are binary. Most asteroids are located between the orbit of Mars and Jupiter. However some asteroids orbit very close to Earth and will from time to time pass-by the Earth. These asteroids are called NEA. We regularly observe NEA asteroids and also some of those that are between the orbit of Mars and Jupiter called Main Belt Asteroids (MBA). We learnt about asteroids by observing the changes in brightness of the asteroid over time. The asteroids are so small that we cannot see them as anything more than just a point of light in the field of back ground stars. No matter how powerful our telescopes are, we will only see them as star-like points of light. 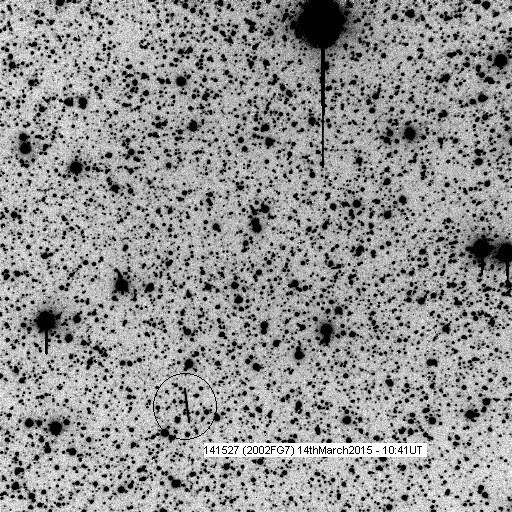 They are very faint and just to capture the lights coming from these asteroids will require long exposure imaging using our powerful telescopes and specialised super sensitive astronomical camera. On the other hand the exposure time can't be too long too since asteroids do move against the background stars and useful information can only be obtained if the asteroids images are star like. In other words if the exposure is too long, the moving asteroids will show up as a streak or streaks in the picture (Picture right) and will be useless for photometry (the science of measuring the asteroids' lights). When upon measuring the lights of this asteroid photometrically we come accross some variation of the light curve that does not fit into a predictable pattern, we will start to suspect that there is something else effecting the light curve. There are 2 main reasons for this variation. The first is variation due to another body orbiting the main body. When one body is moving in front of the main body, there is a sudden slight dip in the light curve and when the body is moving behind the main body, the will be another slight deep in the observed light curve (Right image) . This way we know that the object is binary. 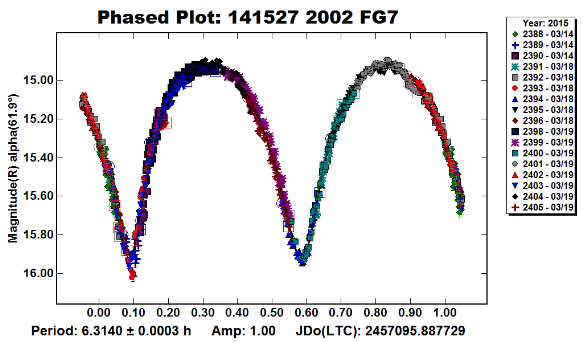 Sometimes when the orbital plane does not line up to our line-of-sight, we will not see these characteristic dips but instead using a special software, we can detect it as another lightcurve of a much longer period. These binary asteroids cannot be seen as more than a single point of light through even the largest earth telescopes. The reason is that they are so faint and the distance between the bodies are too close to one another. On rare occasion when the asteroids come very close to the Earth, astronomers using large radio telescope using RADAR echo technology can detect the binary nature of the asteroids. The second variation in photometry is due to the object tumbling through space rather than the regular rotation on a single axis. The lightcurve appearance is somewhat more complicated but with a special software, the secondary lightcurve can also be derived. Our latest research result has been published in CBAT (Central Bureau for Astronomical Telegrams), a clearing house where all discoveries are sent and processed. indicate a lower limit on the secondary-to-primary mean-diameter ratio of 0.24. The mean absolute R magnitude of the system is H_R = 12.50 +/- 0.04 and the slope parameter G = 0.11 +/- 0.04. 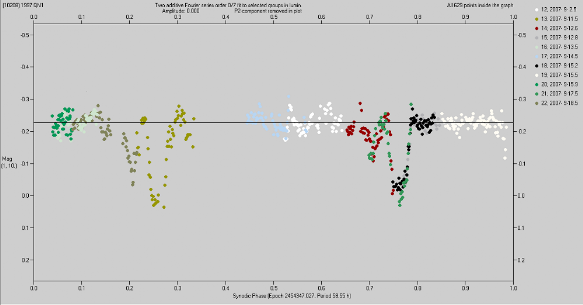 V. Reddy and D. Takir, Planetary Science Institute, Tucson, report that near-infrared spectroscopic observations (0.7-2.5 microns) of minor planet (4541), obtained on Apr. 26 using the NASA Infrared Telescope Facility on Mauna Kea, show that it is an S-type minor planet with surface composition dominated by the minerals olivine and pyroxene. Visit our Minor PlanetResearch Photometry page and learn more about what we do as part of international studies into minor planet research. 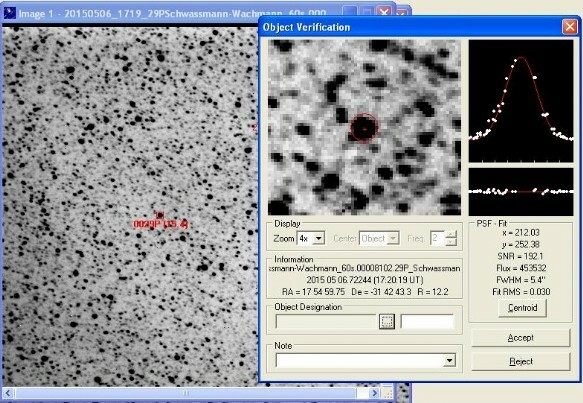 The latest astronomical events reported from BMO is the out burst of periodic comet 29P/Schwassmann-Wachmann observed on the early morning of 6th of May 2015. The 5th of May image on the right show nothing visible within the circle. 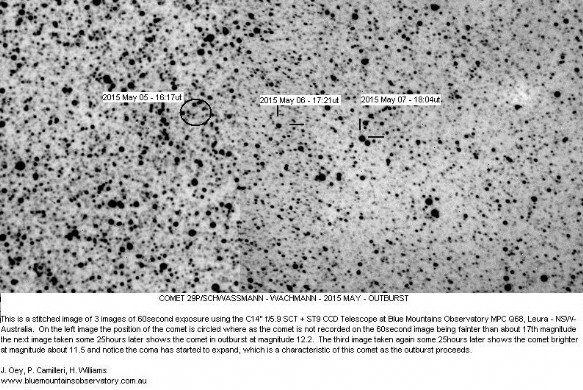 The comet was there but at 18th magnitude, it was too faint for our 14" telescope to detect. However on the 6th of May image, there was a bright object within the centre of the circle that indicated that the comet had brighten up by more than 6 magnitudes over the course of just 1 day. The out burst was predicted but we were the first to captured the event. We have observed and provided astrometry to relevant bodies such as Minor Planet Center(MPC) and AAVSO numerous Asteroids, Comets, variable stars, Novae and Super Novae. over 2000 minor planet astrometric measurements of more than 200 asteroids. 790 comet astrometric measurements of 39 different comets all reported to Minor Planet Center.